"The 12" Mixes" was an Australian series of budget EPs collecting five 12" versions by a featured artist. 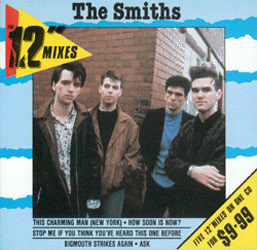 This release is the Smiths volume in the series. 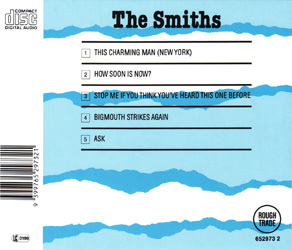 Because the Smiths only had "This Charming Man" remixed, it is the only song on this compilation to fit the theme. The other tracks are the full length album versions as they appeared on the 12" singles. Although less collected, the cassette is much more scarce than the cd format. 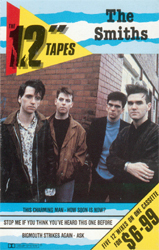 The front shows a publicity shot of the band over the generic artwork used for every other artist featured in the series. The back repeats the theme as a background for the band name, track listing, logos, catalogue number and barcode (view front and back from left menu). There is no booklet, just a square insert. On its flip is repeated the track listing, with credits and legal notes, all in black over white. The cd surface is basic silver with black text printed directly onto it. 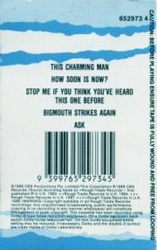 The cd's front and back artwork were adapted for the cassette format (view left). The back of the insert is full. The track listing is repeated inside, with credits, all in black and white. Also found inside is a list of other artists featured in the series. The cassette is made of clear plastic, and the full programme is repeated on both sides.